Welcome to ABC: Affirmation of Baptism Class! The goal of all that we do as "ABC" (which stands for Affirmation of Baptism Class, in case you missed it), is to prepare young people to publicly affirm their faith and then to LIVE IT OUT for the rest of their lives. Faith is no head trip, it is active trust in the living God made known to us in Jesus by the power of the Holy Spirit. We hope you will answer: I do, and I ask God to help and guide me. worship, prayer, Bible reading, service, generosity, telling others about Jesus, etc. And we have fun while doing it! The home is the place where our faith is nurtured and lived out every day. Parents/grandparents/godparents: it's up to you. But you're not in it alone! The congregation (especially the Family & Youth Ministry Team) and pastors are here to help you! Every night before bed. Share. Read. Talk. Pray. Bless. Use the Taking Faith Home sheets provided every Sunday at worship, and also on the "Learn" tab of this website. Parents; want to learn more about this process? Get a copy of Holding Your Family Together from Pastor Lindean. A NEW page is up under "Worship" - all about Advent - check it out! 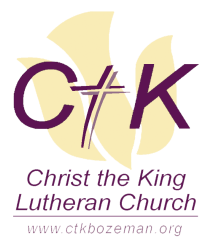 CtK's ABC ministry has a three-year rotation of emphases: Old Testament, New Testament, Small Catechism. I'm all about that grace! Tweens, teens and parental eyes on internet/smartphone use. This is a great blog post by one of Pr. Lindean's favorite bloggers. It's short. Read it.